Auction clearance rates have fallen to record lows (in terms of my records!) – which for Sydney and Melbourne are consistent with further price falls running around 8-10% pa – and housing credit continues to slow. Clearly a deeper slump in national property prices – say a 25% top to bottom fall rather than the 10% we are expecting – would cause severe economic damage but in the absence of much higher interest rates or unemployment causing mass defaults this is unlikely. Australia hasn’t seen the sort of deterioration in lending standards seen in the US prior to the GFC that saw people with “no income, no job, no assets (NINJA’s)” get loans and where the Fed raised rates 17 times over two years! And unlike in the US, Australian mortgages are full recourse loans so there is no “jingle mail”. So, a US GFC style surge in defaults adding to downwards pressure on prices is unlikely. Fear of the Fed. The Fed provided no real surprises and nor did US inflation, but investors became increasingly nervous that Fed hikes would crush US growth and profits. US dollar strength. While the US dollar did not rise above its 2016 high it caused problems in the emerging world where US dollar denominated debt is high. President Trump’s trade war. This was always a high risk for 2018 and once it got underway it weighed on share markets. While the initial focus seemed to be the US versus everyone it morphed into fears of a new Cold War with China adding to fears about growth and profits. China slowdown. This was as expected to around 6.5% as a result of credit tightening but fears that it will combine with the trade war and get worse added to global growth angst. Global desynchronisation. US growth was strong, but it slowed in Europe, Japan, China and the emerging world. Australia saw growth around trend and made it through 27 years without a recession, as infrastructure spending, improving business investment and strong exports helped support growth and this in turn drove strong employment growth, a fall in unemployment and the Federal budget closer to a surplus. Against this though credit conditions tightened significantly with the Royal Commission adding to regulatory pressure on the banks, house prices fell, wages growth edged up but remained weak and inflation remained below target, all of which saw the RBA leave rates on hold. Overall this drove a volatile and messy investment environment. Global shares saw weak returns in local currency terms with significant corrections around February and October. But this masked positive returns from US shares but weakness elsewhere. 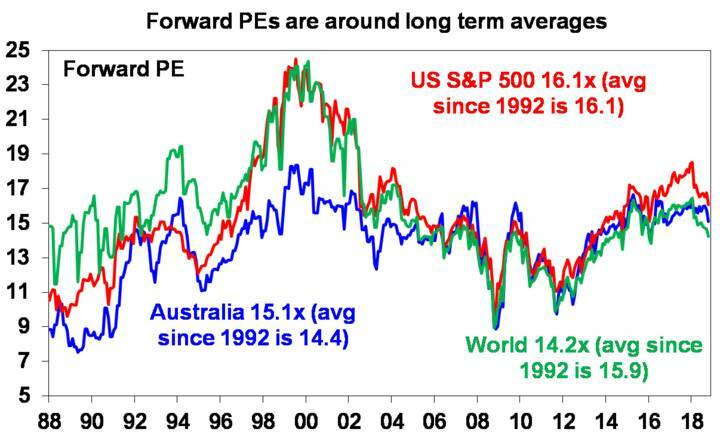 Global share returns were boosted on and unhedged basis because the $A fell. Asian and emerging market shares paid the price for being star performers in 2017 with losses thanks to a rising $US causing debt servicing fears, the US trade war posing a threat to growth and political problems in some countries. Australian shares were hit by worries about the banks, consumer spending in the face of falling house prices and weakness in yield-sensitive telcos and utilities offsetting okay profit growth and low interest rates. Government bonds yet again had mediocre returns reflecting low yields and capital losses from rising yields in the US as the Fed hiked. 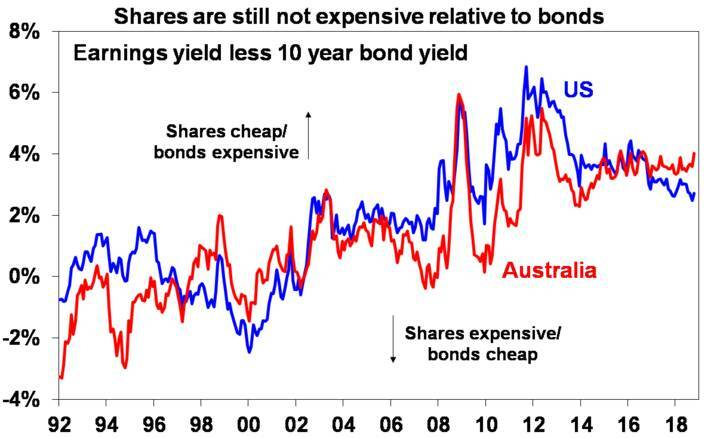 Australian bonds outperformed. Real estate investment trusts remained constrained on the back of Fed tightening and higher bond yields. Unlisted commercial property and infrastructure continued to do well as investors sought their still relatively high yields. Commodity prices were weak on global growth worries and the oil price had a roller coaster ride, first surging ahead of US sanctions on Iran then crashing as demand fell. Australian house prices fell led by Sydney and Melbourne. Cash and bank term deposit returns were poor reflecting record low RBA interest rates. Reflecting US dollar strength, the $A fell not helped by a falling interest rate differential and lower commodity prices. Reflecting soft returns from most assets, balanced superannuation fund returns were soft. In a big picture sense, the global economy looks to be going through a mini slowdown like we saw around 2011-12 and 2015-16. This is most evident in business conditions indicators that have slowed but remain okay. See the next chart. Global growth to stabilise and then resynchronise. Global growth is likely to average around 3.5% which is down from 2018 but this is likely to mask slower growth in the first half of the year ahead of some improvement in the second half as China provides a bit more policy stimulus, the Fed pauses in raising interest rates, the fall in currencies against the $US dollar provides a boost to growth outside the US and trade war fears settle down (hopefully). Overall, this should support reasonable global profit growth. Global inflation to remain low. With growth dipping back to around or just below trend in the short term and commodity prices down inflation is likely to remain low. The US remains most at risk of higher inflation due to its tight labour market, but various business surveys suggest that US inflation may have peaked for now at around 2%. Monetary policy to remain relatively easy. The Fed is likely to have a pause on rate hikes during the first half and maybe hike only twice in 2019 as it gets into the zone that it regards a neutral. Rate hikes from other central banks are a long way away. In fact, further monetary easing is likely in China and the European Central Bank may provide more cheap funding to its banks. Geopolitical risk will remain high causing bouts of volatility. The main focus is likely to remain on the US/China relationship and trade will likely be the big one. While Trump is likely to want to find a solution on the trade front before tariffs impact the US economy significantly & threaten his re-election in 2020, it’s not clear that this will occur before the March 1 deadline from the Trump/Xi meeting in Buenos Aires so expect more volatility on this issue. Wider issues including the South China Sea could also flare up along with negotiations around Italy’s budget. In Australia, strength in infrastructure spending, business investment and export values will help keep the economy growing but it’s likely to be constrained to around 2.5-3% by the housing downturn and a negative wealth effect on consumer spending from falling house prices. This in turn will keep wages growth slow and inflation below target for longer. Against this backdrop the RBA is expected to cut the official cash rate to 1% with two cuts in the second half of 2019. 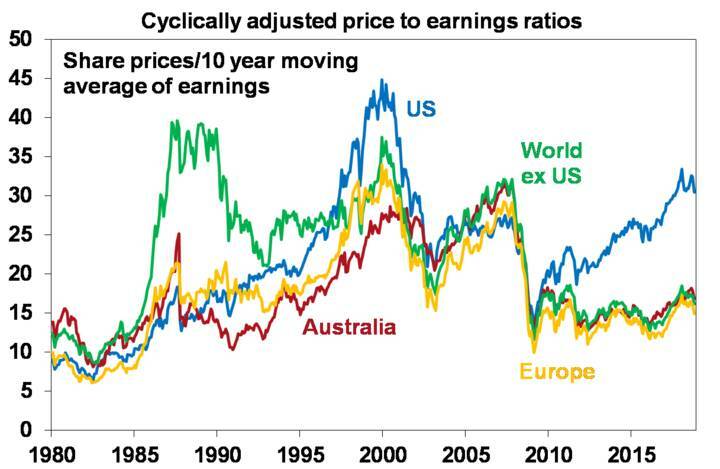 Global shares could still make new lows early in 2019 (much as occurred in 2016) and volatility is likely to remain high but valuations are now improved and reasonable growth and profits should see a recovery through 2019. 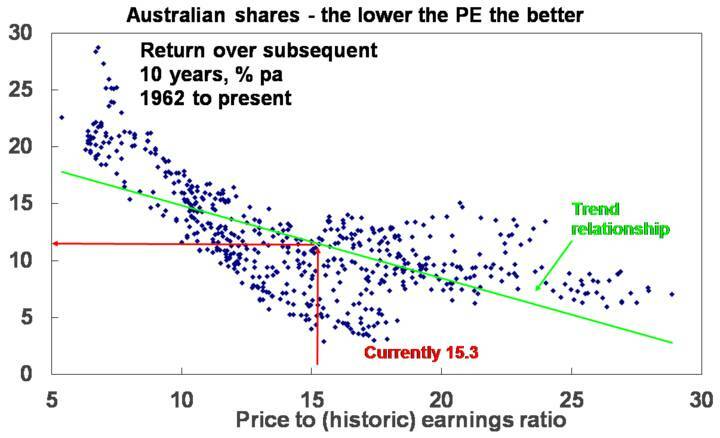 Australian shares are likely to do okay but with returns constrained to around 8% with moderate earnings growth. Expect the ASX 200 to reach around 6000 by end 2019. 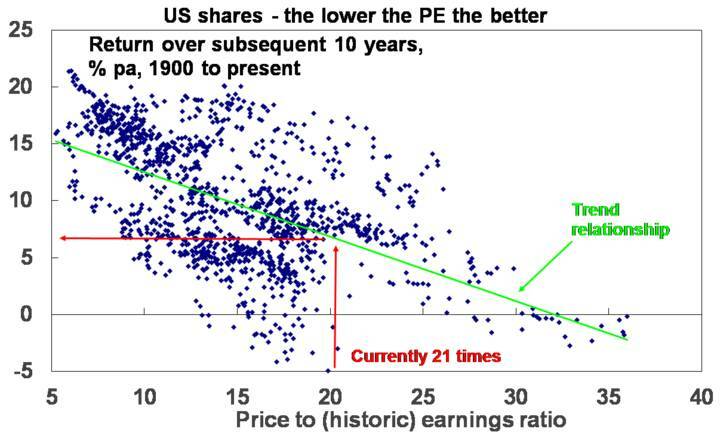 Low yields are likely to see low returns from bonds. Unlisted commercial property and infrastructure are likely to continue benefitting from the search for yield but it’s slowing. National capital city house prices are expected to fall another 5% led again by 10% or so price falls in Sydney and Melbourne as tighter credit, rising supply, reduced foreign demand and potential tax changes under a Labor Government impact. Cash and bank deposits are likely to provide poor returns. The $A is likely to see more downside into the high $US0.60s, as the gap between the RBA’s cash rate and the Fed Funds rate goes further into negative. US inflation and the Fed – our base case is that US inflation stabilises around 2% enabling the Fed to pause/go slower, but if it accelerates then it will mean more aggressive tightening, a sharp rebound in bond yields and a much stronger $US which would be bad for emerging markets. Global growth indicators – if we are right growth indicators like the PMI shown in the chart above need to stabilise in the next six months. We often shop around to get the best deal when it comes to consumer items but the same should apply to financial services. As Governor Lowe points out “don’t be shy to ask for a better deal whether for your mortgage, your electricity contract or your phone plan”. The same applies to your insurance, banking, superannuation, etc. It’s a highly-competitive world out there and financial companies want to get and keep your business. So when getting a new financial service it makes sense to look around. And when it comes time to renew a service – say your home and contents insurance – and you find that the annual charge has gone up way in excess of inflation (which is currently around 2%) it makes sense to call your provider to ask what gives. I have often done this to then be offered a better deal on the grounds that I am a long-term loyal customer. Yeah, I know that it’s a long time since offical interest rates were last raised in Australia – in fact it was way back in 2010. So as Governor Lowe observes “many borrowers have never experienced a rise in official interest rates”. But don’t be fooled by the recent history of falling or low rates. My view is that an increase in rates is still a long way off (and they may even fall further first) – but that’s just a view and views can be wrong. History tells us that eventually the interest rate cycle will turn up. Just look at the US where after six years of near zero interest rates, official US interest rates have risen 2% over the last three years. So, the key is to make sure you can afford higher interest payments at some point. And when official rates move up the moves tend to be a lot larger than the small out of cycle moves from banks that have caused much angst lately. Rising US interest rates, trade wars, the US midterm election results, etc – should investors be worried? For government bonds the yield is similarly a good guide to value. Over the medium term the main driver of the return a bond investor will get is what bond yields were when they invested. 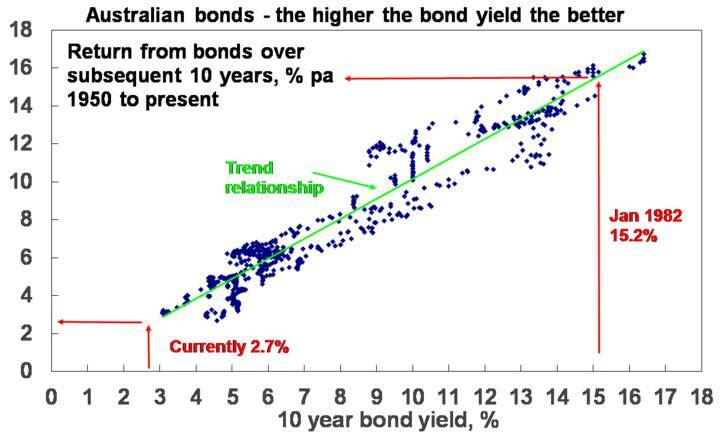 While the relationship is not perfect, it can be seen in the next chart – which shows a scatter plot of Australian 10-year bond yields (horizontal axis) against subsequent 10-year returns from Australian bonds based on the Composite All Maturities Bond index (vertical axis) – that the higher the bond yield, the higher the subsequent 10-year return from bonds.